Directions: Use preferable after tooth brushing. Let the lozenges melt in your mouth, preferably after tooth brushing. Recommended daily dose should not be exceeded. Storage: Store in a dry place, not above room temperature (max 25 °C / 77 °F). Keep out of reach of children. Bulking agent (isomalt), Lactobacillus reuteri DSM 17938 and Lactobacillus reuteri ATCC PTA 5289, fully hydrogenated palm oil, peppermint flavor, menthol flavor, peppermint oil and sweetener (sucralose). One lozenge consists of a minimum of 200 million live L. reuteri Prodentis. Net weight per lozenge, 800 mg. Excessive consumption may have laxative effects due to the content of sweeteners in the product. 1-2 lozenges per day. Use regularly for good oral health. Consumption of foods containing isomalt and sucralose instead of sugar contributes to the maintenance of tooth mineralization. This product should not be used as a substitute for a varied diet. 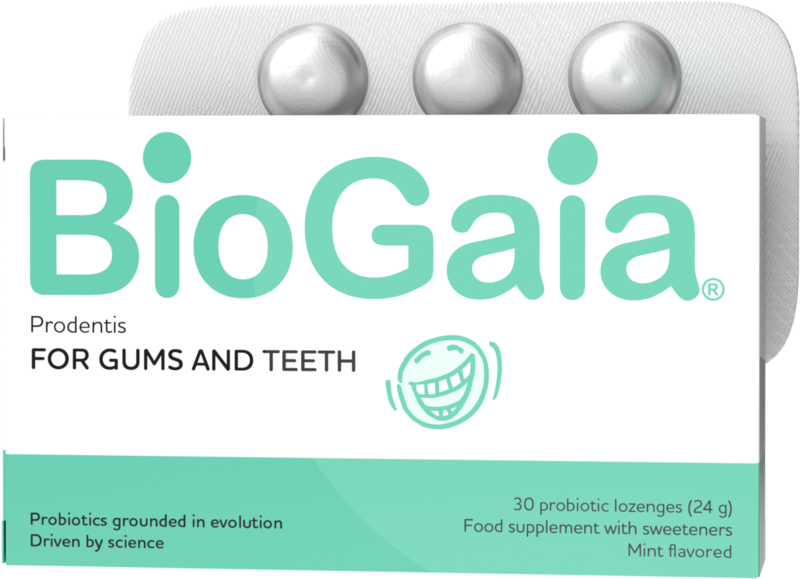 Can I use BioGaia Prodentis lozenges if I am intolerant and/or allergic to gluten, lactose and/or milk protein? In BioGaia Prodentis lozenges neither milk protein nor lactose are detectable, and the gluten level is below EU limit value for gluten-free products. As food regulation varies from country to country, the product labelling may differ. Can Prodentis be used by patients that suffer from intolerance and/or allergy? The culture, which is used in the product, is fermented either on a skim milk or a barley based medium. Analytical data reveals milk protein, lactose and gluten in the culture. However, in the finished product neither milk protein nor lactose are detectable, and the gluten level is below EU limit value for Gluten free products according to Commission Implementing Regulation (EU) No 828/2014 (<20 mg/kg). As allergen food labelling regulation may vary from country to country, local regulation has always to beconsidered when labelling this product.